Widely distributed throughout the Amazon region in Brazil, Ecuador, Peru and Bolivia. Of the L numbers, three are Brazilian in origin. L011 hails from the Rio Xingú, L035 from the Rio Araguaia and L116 from the Rio Trombetas. 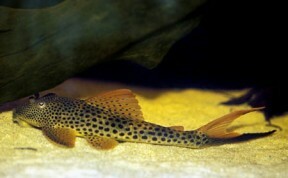 L108 is native to the Rio Napo in Ecuador. 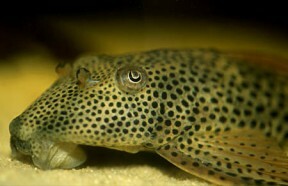 It lives in flowing, highly oxygenated waters running over sandy substrates that are scattered with rocks and stones. 48″ x 18″ x 18″ (120cm x 45cm x 45cm) – 243 litres is just about adequate for a single fish, but a much bigger tank would be needed to house more than one of these. A spacious tank is required, preferably with a sandy substrate. Provide hiding places and shade with some big chunks of driftwood and smooth rocks. Dim lighting is also beneficial. Try to arrange the decor so as much of it is off the tank bottom as possible, as the fish moves with great speed at times, especially when startled. It also needs well-oxygenated water, and an efficient filter to deal with the large amounts of waste it produces. An unfussy feeder, it will accept most foods. Offer regular feedings of greens such as cucumber, courgette, blanched spinach etc., as well as dried, live and frozen stuff. A peaceful species that can be kept with a variety of tankmates, such as larger characins, cyprinids, peaceful cichlids and other catfish. 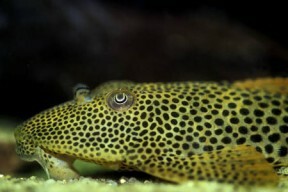 It’s surprisingly non-territorial and can be kept both in a species group or other peaceful Loricariids. Bear in mind that smaller species may be intimidated by its size. 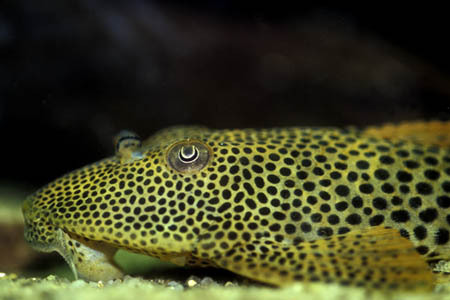 This attractive species is often seen for sale at around 3-4″ in length (often as Hypostomus cf. emarginata or H. emarginatus), but given its adult size, its not a terribly good choice for the general community tank. Due to its very wide natural distribution, there are a number of known geographical variants, and this has resulted in four L numbers currently being assigned to it. 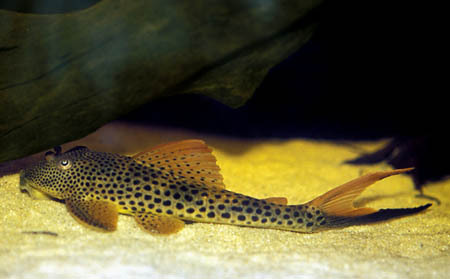 In reality, there are many more variants than this, and all share the characteristic elongated caudal fin which gives rise to the common name of the fish. As always, when buying Loricariids such as this check the fish has a rounded belly and that its eyes aren’t sunken, as these are classic signs of emaciation in newly imported specimens.